Rmember 1996? An invention called the DVD launched in Japan. A new group called the Spice Girls made a splash with their first hit song, "Wannabe." A little-known auction and shopping website named eBay was created. And a movie called Independence Day about an alien attack and the people fighting to save the planet, exploded into theaters. The sci-fi epic film from director and co-writer Roland Emmerich and producer and co-writer Dean Devlin was the year's top grossing film. Independence Day also broke records as history's first film to earn more than $500 million internationally. "The film changed everything," says Devlin. "Before that we were struggling filmmakers. We had one semi-hit movie [Stargate]. This was our chance to do something big and it exploded beyond our wildest dreams." Original cast members, Jeff Goldblum, Bill Pullman, Judd Hirsch, Vivica A. Fox and Brent Spiner reprise their roles. While Liam Hemsworth, Charlotte Gainsbourg, Jessie Usher, Maika Monroe and Sela Ward join the cast. Much has changed in two decades. The American president is a woman played by Sela Ward. "You know who we have to thank for that?" said Ward at the film's press conference this week on the set in Albuquerque. "Our fabulous director: forward thinking, non-sexist, awesome, socially responsible Roland Emmerich!" While filming is under way at Albuquerque Studios, 20th Century Fox offered a sneak peek into the making of the movie. Click here to see photos from the set, and view video highlights from the press conference with the cast and Emmerich. 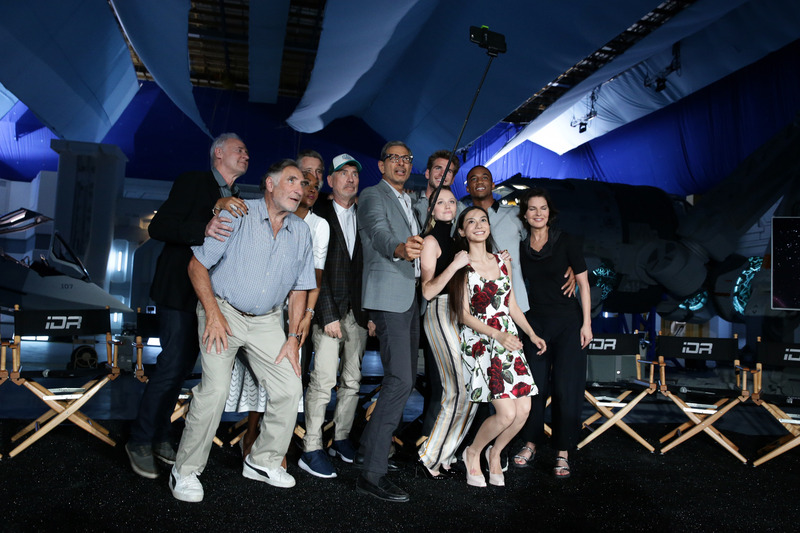 The cast and director Roland Emmerich take a selfie.